Life on land experienced great changes during the Permian. Ferns lost ground, and seed plants became more widespread. Vertebrates became increasingly numerous, and several new groups of reptiles appeared. Amphibians became fewer due to drier climatic conditions and competition from new species. The period ends with the most extensive mass extinction that has thus far occurred on Earth. Life in the ocean was worst affected. There was a dramatic increase in both species and populations of land-dwelling reptiles. Three main types of reptiles evolved. They differed mainly in the number of openings behind the eye socket in the skull. The openings reduced skull weight and provided additional space, primarily for jaw muscles. 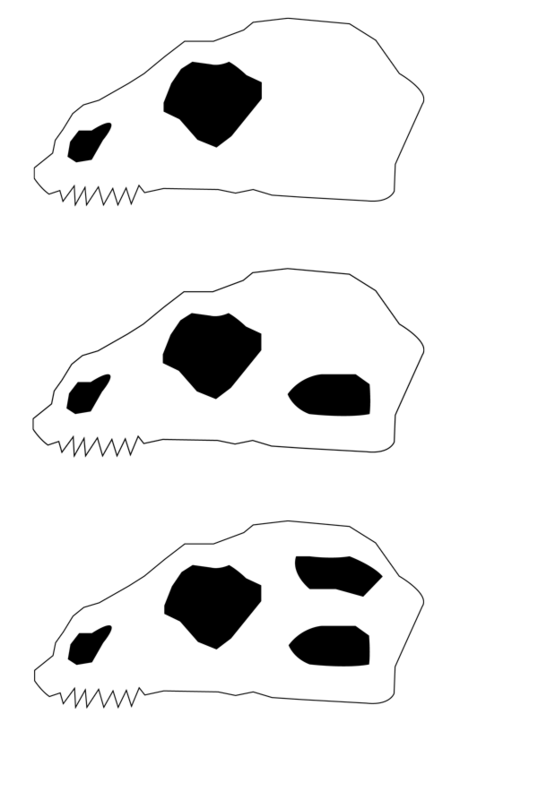 Anapsid reptiles, top, lacks openings in the skull. Synapsid reptiles, middle, has one opening and were the ancestors of mammals. Diapsid reptiles, bottom, has two openings. The skulls of anapsid reptiles had no openings behind the eye socket. They were probably ancestors of turtles and were common during the Permian. Diapsid reptiles had two openings behind the eye. From these reptiles descended lizards, snakes, crocodiles, dinosaurs and birds. They were few in number during the Permian, but became increasingly common during the following period, the Triassic. 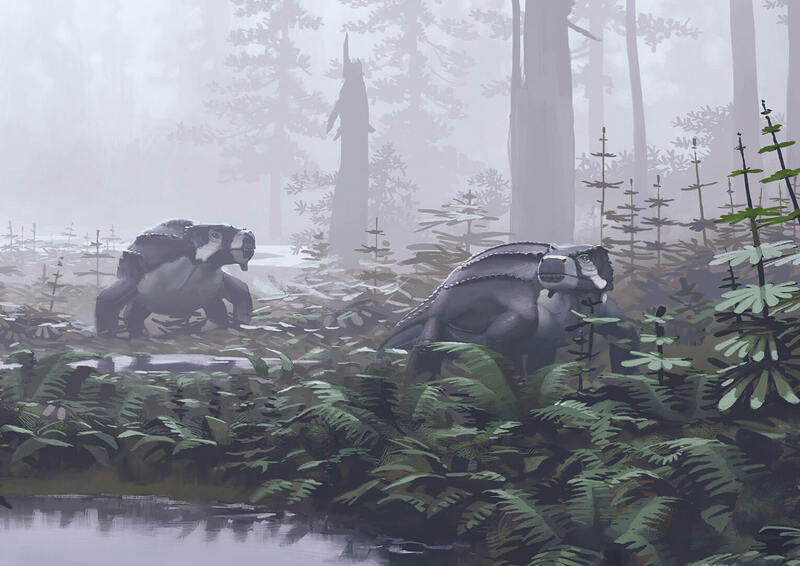 During the period preceding the Permian, the Carboniferous, land-dwelling reptiles were predators that fed on insects, despite the fact that plants were abundant on all continents. During the Permian, however, several groups of vertebrates began to feed on plants. In order to eat plants, adaptations to the teeth were necessary. Previously, reptiles had sharp and pointed teeth. They changed during the Permian and became teeth that were suitable for chewing. Reptiles began to eat plants, a type of food of which they previously had made little use. The result was an increased food supply, which made it possible for reptiles to become larger and the number of individuals to become greater. With a length of up to three metres, Bradysaurus was one of the Permian’s largest plant-eaters, you can see one before you. But some species were even larger. Bradysaurus, a common permian plant eater. Weighed up to a ton. Other, smaller plant-eaters also evolved new ways of life. Some species were bipedal and resembled lizards. Others looked like rats and could dig in the soil. At the end of the Permian, a climatic change occurred which led to the most extensive mass extinction that has yet occurred. Up to 95 per cent of all species on Earth may have been wiped out. It did not happen all at once, but gradually over some one million years. Different animal groups were affected at different stages. The vast majority of extinctions appear to have occurred in the oceans. Trilobites, predatory fish and many corals were among the groups that died out, while some mussels, snails and crustaceans survived. Huge emissions of carbon dioxide and methane from volcanoes may have caused perms mass extinction. The causes of the Permian mass extinction have long been the subject of discussion. One possible explanation is an enormous release of carbon dioxide and methane from volcanoes. The result would have been a greatly intensified greenhouse effect leading to a rapid increase in temperature. It is estimated that the Earth’s average temperature increased dramatically during the course of only 10,000 years, which could have altered the paths of ocean currents. The massive emissions of greenhouse gases probably resulted from exceptionally powerful volcanic activity that continued over a long period of time. In Siberia there are traces of huge volcanic eruptions, kilometre-thick layers of hardened lava that cover an area five times the size of Sweden. 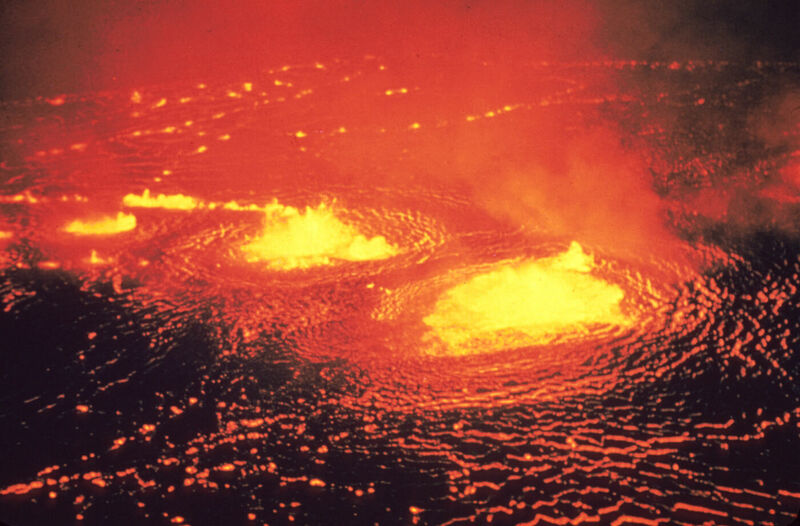 The lava has been dated to the end of the Permian, indicating that the eruptions occurred during exactly the same time as the mass extinction. Another explanation of the Permian extinction is that a meteorite crash resulted in long periods of acid rain and rapidly fluctuating oxygen levels. Yet another theory is that the formation of the giant continent, Pangea, resulted in lower sea levels and changes in ocean currents.